Performers include: George Lopez, Belita Moreno, Valente Rodriguez, Constance Marie, Luis Armand Garcia, Masiela Lusha, Emiliano Diez, Jack Blessing, Aimee Garcia, Mark Tymchyshyn, and Bryan Fisher. A family sitcom that centers on the fictional life of comedian George Lopez. George enjoys a happy marriage with his patient wife Angie (Constance Marie) as they raise their children together; rebellious Carmen (Masiela Lusha) and mischievous Max (Luis Armand Garcia). George works as the plant manager of a Los Angeles airplane parts factory with his affable friend Ernesto “Ernie” Cardenas (Valente Rodriguez). Angie’s father, Dr. Victor “Vic” Palmero (Emiliano Diez), offers guidance, which often counterbalances that of George’s acerbic but loving mother Benita “Benny” (Belita Moreno). They should had been a season 7. ABC screwed up big-time. This was a brilliant show. I wish Carmen’s character was actually featured in the last season… It’s not like the actress had any other major projects going on. The last time I saw her, it was an America’s Most Wanted Re-enactment. I didn’t watch “George Lopez” very much during it’s primetime run, but I started when it began syndication on Nick-at-Nite. It’s hilarious and I love it. I especially watch for Constance Marie (Angie), who is extremely gorgeous. 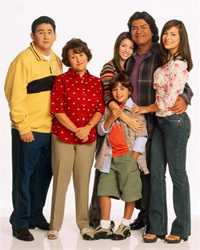 I really enjoy George Lopez, his show features a clean, everyday family that the average family can relate to. Too sad it is being canceled. Good luck to George and the crew. I definitely agree….The George Lopez Show was definitely a big success especially here in Australia. Real life issues… A modern day Cosby Show. REally annoyed with those who cancelled such an original show. I really love the George Lopez show, I think there should be more comadys like Geore and according to Jim on the air. We don’t see many good comadys anymore and its a shame. will the George Lopez show ever start again?